…GORGEOUS flower arrangements for dirt cheap! Previous Post Southern Proper Monogram Winner! One Saturday I'm going to end up seeing there. I love that Saturday tradition! Farmers Markets make me so happy! Love all of the pops of colors from the fresh fruits and veggies to the flowers. Such beautiful bouquets! I need to try this one out (can you believe I have never been to it?!). I always go to the Yorkmont farmers market. Maybe this Saturday will be the day that I check out Kings Dr! I'm going to have to go! I LOOOOOVE FARMERS MARKETS! And that whire flower arrangement, I want it! Those peaches look amazing. I am jealous. 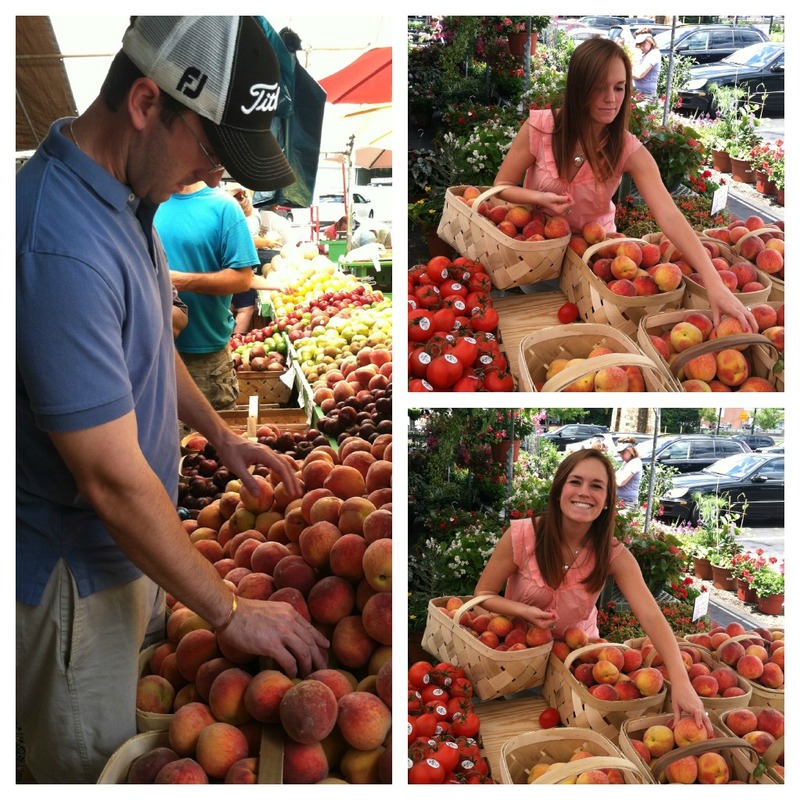 Our small-town farmer's market is quaint & cute, but the colors & variety you have our great! Farmers Markets are the best! I always tend to over buy because everything looks amazing. Oh my goodness, those bouquets…gorgeous!! I sure hope you got one! I need to start going there! Dying for some good fruit.. especially watermelon! I have never been to this one for some reason. I always go to the one off of Yorkmont. But I will definitely check this one out soon. You are so cute with your peaches. XOXO. i loveeeeeeeee fresh flowers on the cheap 🙂 farmers markets are one of my favorite things about summertime 🙂 enjoy! when we lived uptown we went there all the time. Now that we are in Huntersville I haven't found a good one up North but this has inspired me to do so. Happy weekend!